Glo is not taking things lengthy at all with its competitors they are not to donate Car to Charity but this time around its a brand new Glo package and as we can recall nearly every week we get new updates as regards one package or the other, this in a bid to win more customers to herself and just like the saying when two elephants are fighting the grass suffers the consequences however in these case the grass seems to be enjoying it. The new Glo Talk Special promises so much bonus, out of which is a total of #4000 free airtime coupled with free 500mb of data to surf the net. Glo Talk Special is a package that gives you six times the value of the subscribed amount and is specially designed for subscribers who use more talk time and fewer data. The product also gives subscribers additional data to gift to another Glo customer for free. For instance, an N100 subscription will give you N400 talk-time to call all networks and 75MB data worth N300. The 75MB data includes 25MB free data that can be gifted to friends and loved ones. 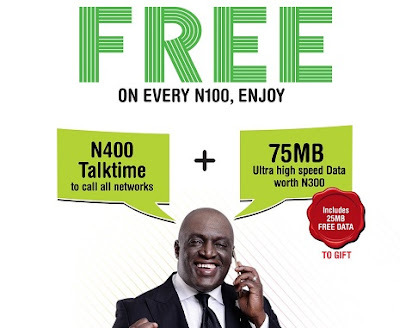 With talk special, you can get N4000 free airtime & over 500MB bonus data when you recharge with N1000. How to Migrate to Talk special? Dial *303# and select the bundle of your choice. Reloaded Twin Bash: Glo has Reloaded Twin Bash which now gives six times the value of the recharge to subscribers and additional data to gift to another Glo customer for free, for those who uses more data and less voice. If you recharge N100, for instance, you’lll get 125MB data worth N500, part of which is 25MB data for subscribers to give out as gift to another Glo customer and N200 talk-time to call all networks. To get reloaded twin bash package, recharge with *223*PIN# or *303# for the bundle package. Reloaded Campus Booster Plus: This package has been improved to give free talk time to customers. The most interesting aspect is that it gives you eight times more value for your existing data while browsing on the campuses across the country. For a N200 data plan, for example, the subscriber gets 200MB of data off campus, but 400MB on campus and an extra N50 as talk-time to make calls. To subscribe to the data plan, dial *777# and choose a Campus Booster Plus Voice plan of your choice.